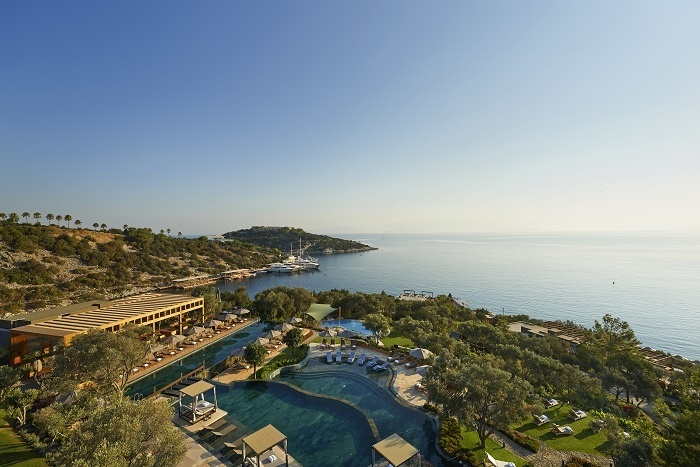 Mandarin Oriental, Bodrum, will re-open for the 2019 season on April 1st. Located on the shores of idyllic Paradise Bay, the five-star retreat has new accommodation, menus and other delights on offer this season. Brand new accommodation at the resort includes two villas and a suite located in its own private cove. The six-bedroom Arya Beach Villa and seven-bedroom Alisya Beach Villa will make excellent private party venues as well as tranquil getaways for families wanting to escape the crowds. Bookable together with the new two-bedroom Water Front Suite or separately, these suites overlook the picturesque cove’s Olive Garden Beach. Mandarin Oriental, Bodrum has nine restaurants and bars, offering a variety of cuisines. Executive chef Dario Abbate, an expert in Mediterranean cuisine, ensures guests enjoy sophisticated gourmet experiences at each resort restaurant. These include world-renowned contemporary Japanese restaurant Kurochan by Ioki, and fish and seafood restaurant Bodrum Balıkçısı. Outdoor activities at the resort ranging from scuba diving and snorkelling to sailing and fishing off Blue Beach. Sports facilities include two tennis courts and a basketball court, a jogging path along Paradise Bay, and multiple swimming pools.